Music marketing tips and self-promotion ideas for independent songwriters, musicians and bands. MySpace just laid off 30% of its workforce. Twitter and Facebook are on a steady rise -- for now. Streaming remote music sites like Spotify (currently available only in Europe) are gaining a lot of traction. And Richard Branson's Virgin Media just launched a new music download subscription service. A LOT of change has taken place in the music industry over the past eight or nine years. Come to think of it, a lot has changed in the past six months alone. People are confused. Musicians want answers. Self-promoters need to know the best way to invest their limited time and money. Industry veterans plead for the roller coaster ride to just stop already! There are no rules, no strict guidelines, no risk-free road maps to widespread fame. Have some fun with it! Experiment. Try stuff. For instance, be the first artist to [do something outrageous] using [the latest hot social site or app]. Fill in the brackets with different combinations till you find a winner. Let your imagination wander and ask lots of "What if ..." questions. Then get busy creating your own little mad scientist music marketing laboratory. But the way you pursue these timeless elements is up for grabs and constantly evolving. And that's where you can thrive today. So let go of your need for certainty. Don't be so tight-assed about needing to know all the answers. Again ... Experiment. Try stuff. And pay attention to the results you get from your efforts. Then simply do more of what works and less of what doesn't. In summary: technological advancement will promote further diversification in the music industry, in terms of business models, content and mechanisms for artist/fan interaction. No single approach is 'the next big thing,' and experimentation is strongly encouraged. No one can afford to wait for proof of concept when the next big innovation is always just around the corner. Millennials [young people who have grown up in the digital age] are constantly experimenting with and evaluating their experience as consumers. We suggest the music business does the same. Sounds like great advice to me! 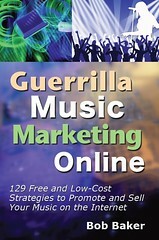 If you don't own it yet, check out Guerrilla Music Marketing Handbook, the classic guide to indie music promotion. Revised and updated, with four new chapters on Internet and Web 2.0 music marketing. Get more tips like these when you subscribe to my free Buzz Factor ezine — the longest running music career tips email newsletter on the planet. Since 1995. Learn more about the free subscription here. Your email address will not be shared. Unsubscribe at any time. Couldn't agree more. Although it's not expressed in your piece (you are always implying it though! ), it is essential that aspiring artists self evaluate themselves and their material before embarking on experimental marketing methods. I'm all for those methods but make sure that you and your songs are strong before you start - that has to be step 1. I'm often asked by young musicians - and their parents - for career advice. Number one on my list: don't get into the music business unless you can't not do it. Unless you have something that drives you, some compulsion that pushes you relentlessly, making a living in the music business can be a very mixed blessing. In a time when there are no answers, when the future of the music business is unclear at best, that drive is more important than ever. And if you have it - if your desire and your muse compels and demands it - then cultivate it! Direct and mold it! Allow it to work for you! And read Bob Baker's advice. It's always great. As always, a very good post. With the dizzying way technology is exploding the best and only certain way to stay on top of what is happening is READ. Subscribe to blogs and emails written by the best minds in music today. THINK OUTSIDE THE BOX. Add to this list of reading matter blogs on marketing, PR, Promotions, etc. Although this be contrary to what you think of your music, think of it as a product and your performance as a service and explore ways in which other successful people in outside fields are marketing, and promoting themselves. EXPERIMENT. Good succinct article on the current state of publicity in music. I like Mark's advice about having the passion and drive - a mandatory requirement indeed. I think it's also notable, and important, to excel at your craft. I see a lot of 'millennials' that actually have an edge on the promotional side of things - merchandising, great exposure, but the real product, the music is about 10% there in terms of development. I'd recommend getting back to the hard work of becoming great artists before chasing illusive dreams in a heavily saturated market. You are right on point, Artist have to remember that are not in the Music business they're in the Business of promoting their Music! A buddy of mine in New York created an income producing and innovative marketing digital tool exclusively for Indie Artist. Check it out and I would appreciate your comments and insights www.thevirtualcd.com. I love Bob! And happy birthday! I'm encouraged and reminded that all viable (certainly with advantages or disadvantages) especially if you know who you are as an artsits, who that fan is and how to build and maintain great fan relationships. I agree - be the first to do something. I devised 'Follow An Indie Band Wednesday' on Twitter using their hashtag search (#faibw), and now every Wednesday artists can post links to their free mp3s, thus gathering more followers, and punters can find these free tracks and also recommend artists they like. Everybody wins! Of course the initial idea was to push my own band, but it's now being blogged all over the place and becoming quite viral. Get Bob's Free Music Marketing Tips by Email. Find out more. Bob Baker is an author, speaker, teacher, indie musician and former music magazine editor dedicated to showing musicians of all kinds how to get exposure, connect with fans, sell more music, and increase their incomes. Want to See Your Name in My Next Book?